Poverty simulation asks, "What could we do differently?" 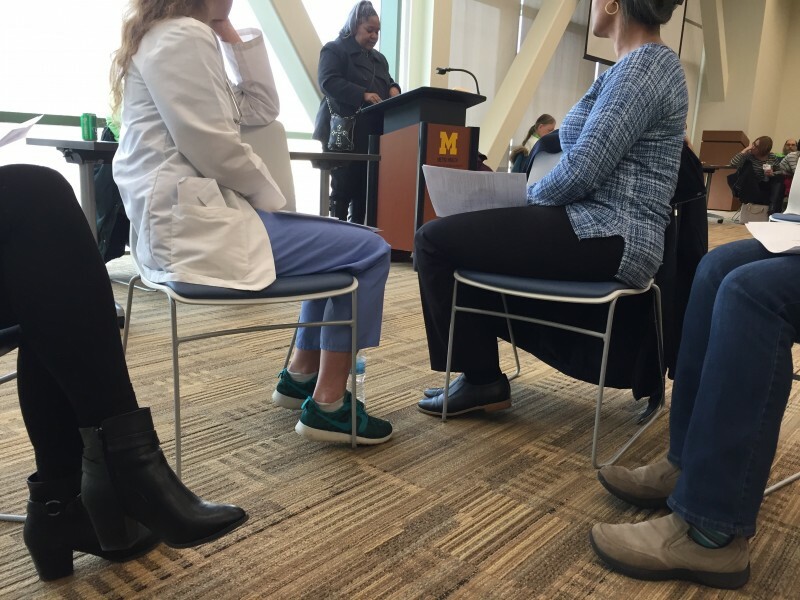 Professionals from Metro Health participate in a poverty simulation and learn the realities some of their patients live every day. To learn more about upcoming poverty simulations, visit accessofwestmichigan.org. Reading a news article about someone living in poverty is one thing. Actually experiencing it is another. Thursday afternoon on February 9, Metro Health Hospital Services hosted a poverty simulation workshop with Access of West Michigan. The goal of the poverty education program is to create awareness of the realities of poverty and bring inspiration for change in an experiential way. 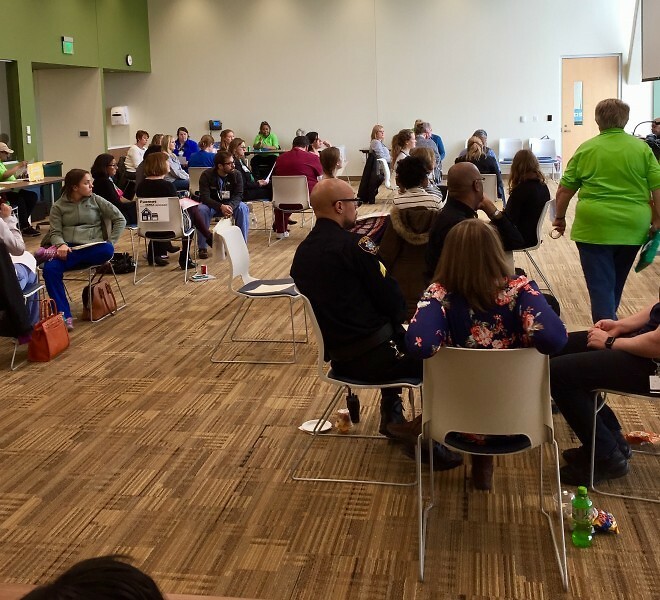 Participants in the Living on the Edge poverty simulation at Metro Health were assigned profiles detailing their name, age, family, income level and other related details. 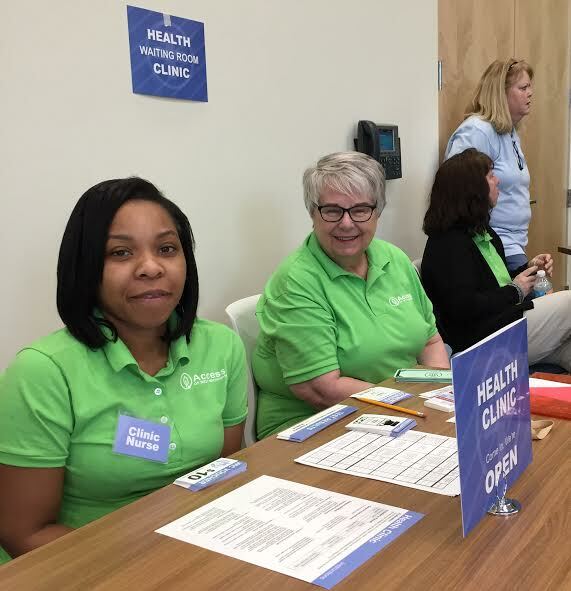 Each “family” then completed four weeks, made up of 15-minute increments, in providing groceries, paying bills, attending doctor’s appointments and other requirements as outlined on their profiles. Following the “month,” participants engaged in small group discussions to debrief and learn from one another’s insights. Linda Bos is a registered nurse with Metro Health and attended the workshop. She, along with Heather Rayman, were given the roles of a 75 and 72-year-old couple struggling to make ends meet. Bos, playing the role of Anthony Xanthos, and Rayman playing his wife, Zelda, spent each “week” trying to keep up on their mortgage payments, provide $50 for food and make it to expensive doctor appointments. At one point during the four weeks, they couldn’t buy groceries. Towards the end of the month, they were evicted from their home as they couldn’t provide proof of their mortgage payment. Mobility was also a major issue for them. Conversations about how they were doing or if they wanted to plan a vacation never arose during their time of balancing their meager budget and keep all their bills afloat “We sure didn’t talk about anything fun,” Bos added. Rayman was reminded, “don’t forget we have to eat at some point in our life,” as she recalled the struggle of purchasing weekly groceries. For both Bos and Rayman, living life as an elderly couple with little money was an eye-opening experience. “Everything was tension-producing rather than pleasurable,” Bos noted. That tension is something Bos knows first hand. While currently employed and doing well, she has felt that same stress. “There was a time when I didn’t have money to buy diapers, when we didn’t have money to pay the mortgage," she said. She said she anticipates building upon that intentionality with those she sees. “I think so often we don’t want to offend people,” she added. “But it’s really just about asking, ‘I want to help, what is it that you need?’” That intentionality, she said, can come through her following up with her clients through phone calls or other additional conversations. To learn more about poverty education and the Living On The Edge poverty simulation workshops, please visit http://accessofwestmichigan.org/about-us/poverty-education/.